THE UK Independence Party (UKIP) in Northern Ireland has confirmed its withdrawal from the Unionist Forum. The announcement was made by UKIP’s Northern Ireland leader David McNarry MLA and has been warmly received by UKIP members provincewide. 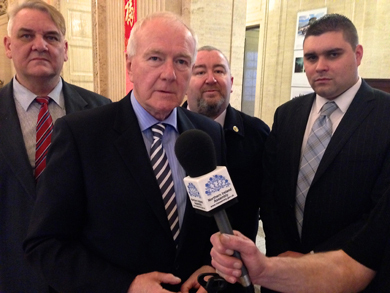 Withdrawal from the Ulster Forum… Alan Lewis, right, with Newry and Mourne Councillor Henry Reilly and David McNarry MLA. Welcoming the announcement, UKIP’s Northern Ireland chairman, Cllr. Henry Reilly said: “The Unionist Forum promised much, but has delivered little of benefit to anyone anywhere. The issues it was established to address remain largely unaddressed. UKIP Down District representative Alan Lewis added: “UKIP at first engaged in this forum and we seen benefit in talking to others within the unionist family. A year ago I said that I support UKIP’s decision to take up their seats on the unionist forum, however, let me be very clear we are not interested in a talking shop that deflects failings. “We want to see a active approach by all shades of unionism to combat what has been a pan-nationalist assault on our culture and traditions.